Rapid population growth and increase in living standards has been a persisting issues for environmentalists and the population alike. Adding to the recurring menace is the open burning by the farmers to clear the agricultural land which generates CO2 and other pollutants. Incorrect and low scale management of agricultural biomass waste are heavy contributors to climate change, water and soil pollution and also local air pollution. Subsequently, it causes problems like rotting biomass waste which emits methane, - a lethal and devastating greenhouse gas. Every year an enormous waste amount of waste approximately 2.12 Billion tons is wasted. A whopping 100 billion metric tons per year of biomass is generated every year. However, if properly managed, the global waste can be of high value in terms of renewable energy production. However, the scenario is fast changing. Interestingly, renewable energy is being accepted as a commercial alternative to fossil-fuel based energy production. This transition to clean, renewable energy is well advancing with a tremendous range of developments. One such project is TerraGreen. It aims to create a global, decentralized biomass waste management, majorly in the agricultural & plantation sector. The creation of such a network will in turn, enable the deployment of an extensive renewable energy infrastructure. Subsequently, it will provide the necessary equipments for proper biomass waste management. TerraGreen envisions to change the perception of waste by industries. More importantly, they see it as a highly untapped resource to the mankind. The project strives to implement a monetary incentive mechanism. With the implementation of this mechanism, people will be awarded for supporting conversion of biomass waste into renewable energy products. TerraGreen aims to solve the current problems of lacking access to state-of-the-art technology and capital for the biomass based renewable energy producers, and to provide access of profitable projects directly to the consumers. This is done with the utilization of the blockchain technology and renewable energy backed coins. Terragreen’s token module comprises of IDE using Graphical user interface (GUI). Here drag & drop feature will be a major attraction for users. The drag & drop features the device gestures, through which the user can select a virtual object by "grab it” and “drag it” to a particular location or onto another virtual object inside IDE. 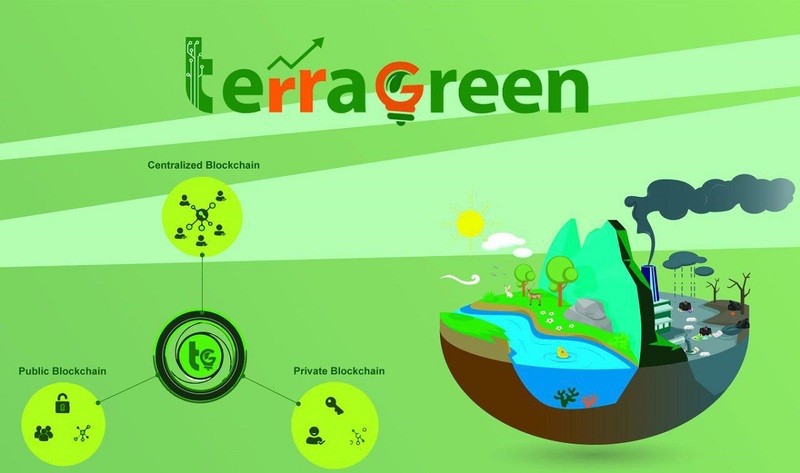 The token module of TerraGreen has enhanced GUI features which are more convenient to the users to create their own tokens. The tokens modules are being actively built on the formation of the blockchains. TerraGreen’s state-of-the-art technology and process are based on technically optimized and cost-effective solutions to convert biomass waste into high value energy products. This is achieved by using latest biomass gasification technology and individual optimized gas conditioning systems, whereby the base for the production of several CO2-neutral synthetic fuels are laid. With it's unique ideology and one of kind technological prowess, TerraGreen is also set to disrupt biomass waste conversion.